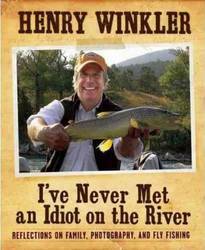 This "New York Times" best-selling collection of humorous anecdotes and heartfelt observations from Henry Winkler shares the joy and wisdom he's accumulated while honing his skills as a fly-fisherman. An accomplished sportsman who meticulously records the measurements of every fish he hooks, Winkler has learned that his yearly trips to the river are not just about catching trout. More importantly, they're about adopting the proper perspective on life. Or, as Winkler puts it, when he's fly-fishing, the river acts like a "washing machine for my brain," recharging him and reminding him that anything is possible. Winkler makes a habit of sharing his angling adventures with his wife, Stacey, and their three children, Jed, Zoe, and Max. The Winklers' annual trip, where they can escape the busy-ness of everyday life, has brought them together as a family. On the river, Henry has grown to appreciate the support his wife and children give him, learned to listen, and developed the confidence to publish his outdoor photography in his first non-fiction book. An expression of the inherent optimism that stems from the simplicity of the outdoors, "I've Never Met an Idiot on the River" is an invitation to share in the realizations and achievements Winkler has found while fishing. Hopefully it will help you catch a few of your own.